Bonjour Scrap ! 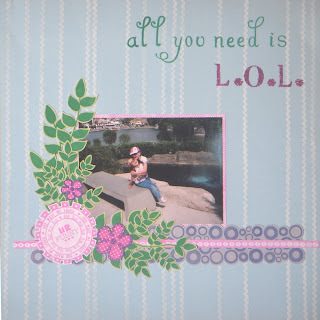 : All you need is L.O.L. All you need is L.O.L. This is the title of the layout I created for one of my workshop. I wanted my student to discover how to use stamps in different ways. So this project is made ONLY with stamps. The background is plain blue with stamped lines, the photo frame is white with pink stamp, leaves are green paper with green stamped leaves, etc... You can recognize Autumn Leaves, Martha Stewart, Making Memories clear stamps. So all you need to scrapbook is paper. And stamps. Lot of stamps... Oh, and inks. Or glue and glitter. Gosh, I think a started a collection of scrapbook stuffs without knowing it. Such a pretty color scheme and awesome work creating a page with only stamps! I love all of the stamping, so pretty!